Namco Bandai is trying to make up for lost time with the PSOne Classics storefront, but wants some advice about what it should sell. The PSOne Classics store has been a boon for many gamers, primarily because it's let us revisit the classic titles we loved when we were growing up (or weren't able to play due to region limitations). One publisher that's been noticeably absent from the store, however, is Namco Bandai. So far, Namco's only released two games (Mr. Driller and Tekken 2), but the company is looking for input about what other titles they should release next. Namco Bandai recently tweeted that it wanted input from its followers about which games they'd like to see on the list of PSOne Classics. Anyone who wants their voice to be heard can send a suggestion to @nbgi_webmaster. 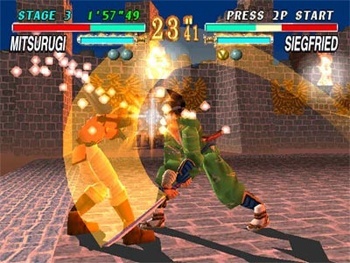 Namco released a slew of games for the original PlayStation console. Personally, I'd like to see Soul Blade released for the PSOne Classics store, but that's mainly because I spent too much time playing that game when I was in high school. How about you? Which game would you like Namco to put out?